Lizzy earned her Doctorate Degree in Physical Therapy from Simmons College in Boston. She has experience working in orthopedic outpatient, inpatient, aquatic and home therapy in both Boston and San Francisco. 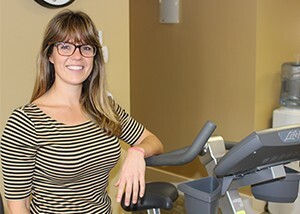 She uses an evidence-based and patient-centered practice to deliver quality care with her focus in orthopedic injuries, post-surgical, musculoskeletal disorders, in addition to balance and neurological disorders. Lizzy is active and enjoys playing racket sports, skiing, sailing, running and is always up for trying a new sport or activity – this year she took interest in squidding and scalloping. She grew up coming to Nantucket since childhood and has interned and volunteered at Nantucket Cottage Hospital prior to joining the Sports Medicine and Physical Therapy team in the Spring of 2015.